All pictures shown are examples of previous commissions. We can put almost any design or logo onto our slippers. For example we make slippers with club/society logos or family crests. You may choose any of the velvet colours: black, navy blue, green, brown or burgundy, satin quilt lining colours: black, red, blue, gold and your logo/crest may be in any colour that you specify. Built and embroidered entirely by hand from finest quality materials, our slippers are then finished with a quality lining of satin. All our slippers are leather soled. 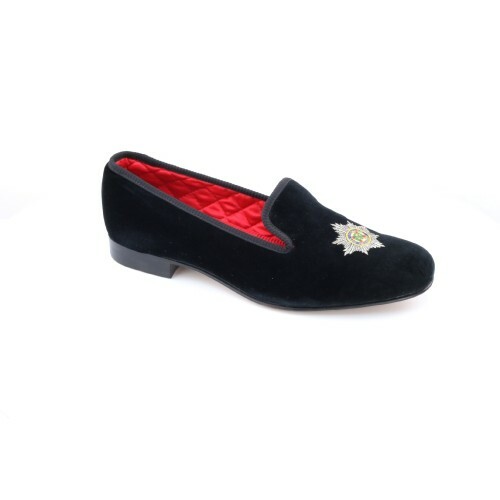 These are arguably the worlds finest slippers, treasured by Royalty, Presidents and Connoisseurs around the world. Call us on 1 800 673 3196 to discuss your requirements. We will normally send you a test slipper to check the sizing before we start work.